The article was published in “Moskovsky Komsomolets” newspaper, November 8, 2017, in Russian. “The last war among people will be a war for truth,” these words of the Great Russian artist, philosopher and thinker Nicholas Roerich proved to be prophetic. Hardly could he have imagined what battle would develop for his legacy. What would have the Shambhala Seeker, Prophet of universal love and compassion, said if he came to know about never-ending trials in which his name appeared? The other day the Moscow Area Federal Arbitration Court upheld the legality of the eviction of the International Center of the Roerichs (ICR) and its Non-Governmental Nicholas Roerich Museum from the estate in the center of Moscow. It is not just about the estate, but about the collection of the Roerichs, estimated at a billion (!) of dollars and which the Museum has lost. Art workers kept silent, because the situation was too slippery and you never know what might happen. What if anyone, who supported the ICR, would be branded an enemy of the State? Social activists, who saved and collected pictures, were labelled by such terms as extremists, members of the mafia, foreign agents. Some of the pictures were arrested with the wording “articles obtained by criminal means.” In such a way, the case of the Master Bank and its head Boris Bulochnik (who was wanted) was attached to the pictures arrest. The paradox is that: the State having “squeezed” (taken away) a part of the collection from the non-governmental organization allowed to take it away, to give away, to sell in a reckless manner both to officials, and to the scoundrels pretending to be Roerich relatives. How did Boris Nemtsov get his paintings? How, if they were wanted, they fell into the hands of oil oligarchs? Why were ... fakes among the stolen works? What Roerich mystery is the escaped Bulochnik hiding? Why would Deputy Minister of Culture Aristarkhov need the collection? It is necessary to begin the narration of this history, mysterious, tragic and criminal simultaneously, with the events of the middle of 30-es. Otherwise one can not understand the relationship of the Roerichs and the Soviet State, at first, and then the Russian one. Nicholas Roerich appealed to the Soviet authorities for the first time with a request to return to his homeland in 1939 when their family lived in India. He sent a letter to the People’s Commissar for Foreign Affairs Maxim Litvinov, “I and the members of my family are now striving to bring our knowledge and creativity to our Homeland.” Nicholas Roerich wrote that he wanted to donate his paintings to the State. Stalin’s resolution was “To leave unanswered.” (The original is kept in the archives of the Ministry of Foreign Affairs). Nobody responded to Roerich. The State rejected Roerich and his works. Nicholas Roerich died. Soon Helena Roerich died. Before her leaving the life she shared the legacy between her sons, the elder George, a scholar, an Orientalist, a linguist, who restored the School of Oriental Studies in Russia, which had been destroyed by Stalin, and the younger son Svetoslav, an artist, a scientist, a public figure. She died one month before her elder son George met with Nikita Khrushchev in 1955 in India. 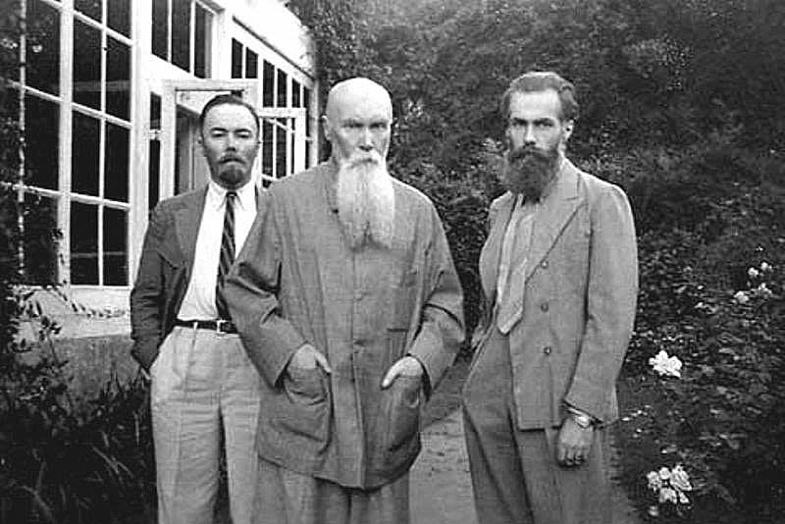 George Roerich talked with Khrushchev, expressed a desire to return to his homeland and organize an exhibition of his father's works. Khrushchev supported the idea. George Roerich sent the first part of the collection from Bombay to the USSR in 1957. “Oh, what a treasure it was!” said the Director of “Register of Cultural Properties” Vladimir Roshchin. “Hundreds of paintings, including those on fabrics (Tibetan tanks), rare ancient books, archaeological finds. George Roerich hoped that all of this became the common property of the people,” and that ordinary people would see it. He also moved to the USSR, obtained the citizenship and got even a four-room apartment in a new house on Leninsky Prospect (Lenin Avenue), a car “Volga” and a summerhouse. Looking ahead, I say that this part of the collection suffered a sad and largely shameful fate. The other half of the heritage remained with Svetoslav Roerich. He was waiting for the right moment to pass it on to people, but not repeat the errors of his brother. So, the legacy that went to George Roerich appeared in the USSR. Here he divided it into two parts. The smaller part, the most favorite and important for him, he left in the apartment on Lenin Avenue. This apartment was supposed to receive the status of a memorial one. It was assumed that researchers of Roerichs’ artwork would come here. The second part of the heritage that of 432 paintings, George passed to the State Museum Foundation of the USSR. “There is a correspondence between the brothers,” told the head of Journalism Department of Moscow State University, the member of the Presidential Council for the Development of Civil Society and Human Rights Ivan Zasursky. “ It shows that the Ministry of Culture promised George to create a museum named after Nicholas Roerich, and it was for this purpose that he handed over the collection. But the museum was not founded. And the collection was just distributed to different institutions. The most tragic thing is that the pictures appeared mostly in storerooms. For example, a large collection of Roerichs’ works at the Russian Museum, more than 300 paintings, is in vaults, and only two or three of them are in the permanent exhibition. Here is a story: Once Boris Nemtsov, being the governor of the Nizhny Novgorod Region, presented a picture from the storerooms of Nizhny Novgorod Museum to the famous musician M. Rostropovich. As much as I love Boris Nemtsov, I wonder: if he gave a picture from the storerooms, then how many pictures were distributed by other governors, museum workers and officials? I dread to think. Are they in storerooms? I am sure that not all of them. Perhaps this explains all the nightmare, that is going on around the heritage over the past three years. But let us return to the course of the narrative. 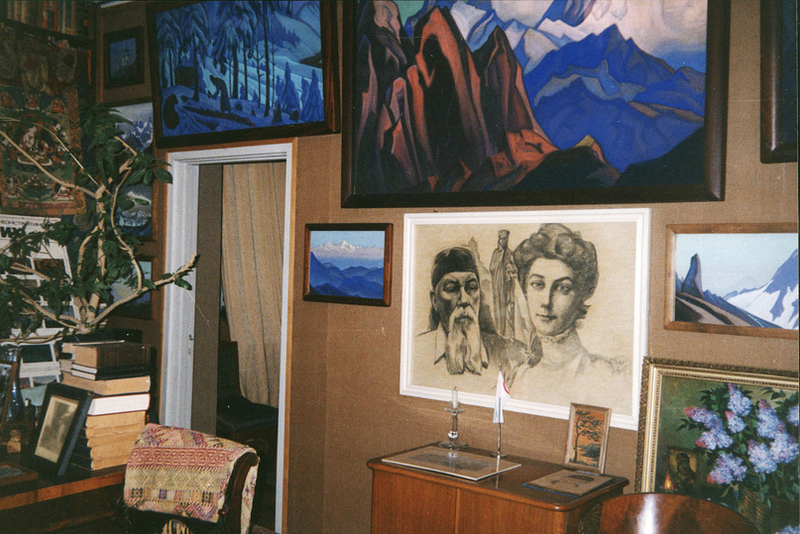 In the Moscow apartment of George Roerich there were 187 paintings, a personal library, which included the books of Helena Blavatsky, Nicholas Roerich, Helena Roerich, rare scientific reference books in Oriental studies, as well as the literature related to the Roerich movement, philosophy and religion of the Orient. But there's more. Archival documents of the Central Asian and Manchurian expeditions. The initial composition of the archive is practically unknown. Nicholas Roerich’s Archive. Includes 572 original typewritten pages of “Diary Pages” and individual documents of personal correspondence of the artist. A collection of Tibetan painting. There are 44 tanks. A collection of religious objects (figurines of Buddhist and Hindu deities, tabernacles, ritual objects of worship, etc.). A collection of archaeological finds of Nicholas and George Roerichs from excavations in Central Asia (Inner Mongolia, Tibet, Western Himalayas). There are hundreds of exhibits. The chair of Nicholas Roerich with ram’s heads and two chairs. Personal belongings of the Roerichs. Clothes of Helena Roerich, Nicholas Roerich and George Roerich; household items (table lamp of Helena Roerich; field binoculars of George Roerich; expedition water jars, sleeping bags and other exhibits). Together with George Roerich, Lyudmila and Iraida Bogdanova lived at the apartment. They came from India together with George Roerich. At a very young age, the sisters joined the Central Asian expedition of Nicholas Roerich (it was held in 1924-1928) and after they remained in the Roerichs’ family as assistants to the household. They helped George Roerich in Moscow too (at the time of the transfer Lyudmila was 54, Iraida 43). The researcher of life and creativity of the Roerichs Pavel Belikov wrote that the Roerichs were treated to the Bogdanovs as the servants, but no more. There was no question of any kind of kinship. This was also evidenced by friends and acquaintances of the Roerichs. Remember this nuance. By that time George Roerich was the head of Philosophy and Religion section at the Institute of Oriental Studies of the Russian Academy of Sciences. He died under rather strange circumstances. His death even associated with the special services. The secret services seemed to have had a great interest with those mystical findings the Roerichs did during expeditions and they did not want the information about this to spread abroad. “The Bogdanov's sisters were recognized as disabled dependents,” the ex-investigator of the Main Investigation Committee of the Ministry of Internal Affairs said. (He dealt with antiquarian affairs and asked not to call his surname). “According to the Decree of the Council of Ministers of the USSR, they were assigned not only an apartment, a car, but also a copyright.” This was a contradiction because his brother Svetoslav as the only relative was his heir. Svetoslav wrote a letter to the Ministry of Culture, in which he objected that the works of Roerich remained in the hands of the Bogdanovs. As far as I know, this letter was hidden by Minister of Culture Furtseva into the archive, it had been in for many years. All of a sudden a man, a certain Victor Vasilchik, appeared in the house of Bogdanovs in 1970. He called himself an incarnation of Nicholas Roerich. I found the people who knew him. Some of them say – “crazy man”, others – “a crook”, the third – “a KGB agent”. Nevertheless, the man completely alien to the Roerichs began to manage in the apartment in Leninsky Prospect (Lenin Avenue).From now on, only “the selected” could get there, only those who he “tested’. It was he who influenced the decision of Iraida Bogdanova to prohibit the publication of Nicholas Roerich‘s “Diary Pages” and not to give pictures to one of the exhibitions. 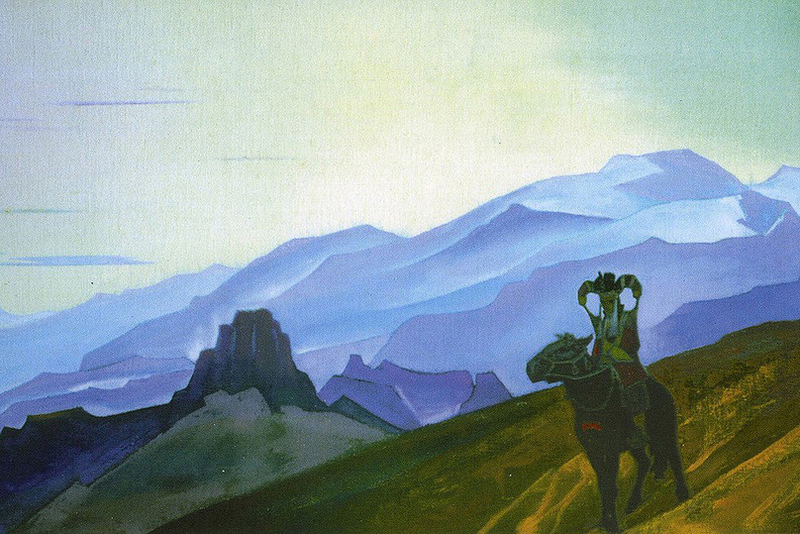 (Nicholas Roerich dreamt of having his works available to everyone). Iraida, enchanted by Vasilchik, followed his advice in everything. She began to call herself the adopted daughter of the Roerichs and began to sign as “Bogdanova-Roerich”. The works of the Roerichs with notes “From the collection of I. Bogdanova” began to appear at the exhibitions. The same indication of belonging was published in the catalogs ...But the main thing is that Vasilchik and Iraida were beginning to sell the collection. Svetoslav Roerich was outraged, shocked! He wrote a letter to the Minister of Culture of the USSR Demichev from India in 1974. In this letter, he completely exposed Iraida, who repaid the family, which gave the shelter to her and her sister, with black ingratitude. Svetoslav Roerich asked the Minister of Culture to save the legacy from plunder, he suggested to take immediately into account all that was left in the apartment. He asked to turn it into a memorial museum. He insisted on assigning a public group of Russian Roerich followers to control over the part of the inheritance that was at George’s apartment. Did the Soviet authorities do something? No. Nobody lifted a finger to save the collection. There is a document in front of me, according to it, Vasilchik on his own behalf concluded a contract for sale of several works to the president of Rosneftegazstroi Ivan Mazur. 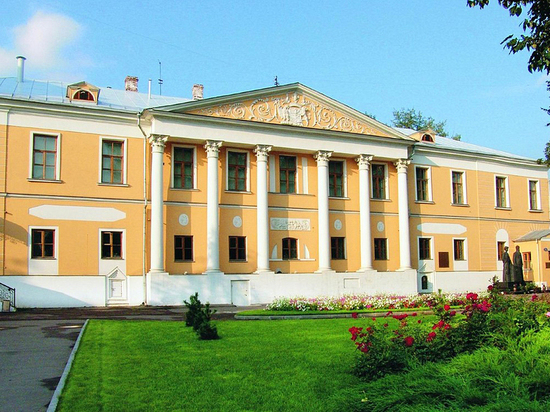 The collection in Lenin Avenue (Leninsky Prospekt) is private, and its owner is free to do with it, as he sees fit. It may be so, but who should be the rightful owner? This was Svetoslav Roerich. “In 2004, a criminal case on the death of Iraida Bogdanova was opened”, said the former investigator of the Interior Ministry. “There was a version that Vasilchik killed her with hunger, he did not call the doctors to her. But the investigation did not find the confirmation of this. And in 2008, a robbery against Vasilchik himself was committed in the apartment on Lenin Avenue (Leninsky Prospekt). The same investigative unit that investigated the death of Bogdanova was engaged in this case. I talked with employees who came to the scene. They said that it was hardly a dramatization for he was badly beaten and fastened to the battery. They were surprised to see him beaten so much, as if the criminals had personal dislike. Among other things, four large works were stolen, each worth 3-5 million dollars. They rolled them and carried out through a window. The pictures were: “Sergius the Builder”, “Bum Erdeni” (Mongolian epos), “The Shambhala” (the second title is “Arrow-letter”) and “The Shadow of the Teacher”. These works fell into the search bases of Interpol. The criminals have not been identified so far, but some pictures have been found. “Among them is the “Tale of Shambhala” of 1946, which the police withdrew from a little-known restorer,” said Vladimir Roshchin. “On September 9, 2010, law enforcement handed it over to Federal Service for Supervision of Compliance with Legislation in the Sphere of Mass Communications and Protection of Cultural Heritage (Rosokhrankultura) for examination. The Deputy Head of this office Viktor Petrakov wrote a letter to the head of the Moscow police to ask not to return it to Vasilchik,”whose ownership right to it is questionable”. In 2011, some people came to me and said they were ready to sell two works “Teacher's Shadow” and “The Reverend’s Works”, the ex-investigator went on. “I explained that they were not to be sold, they were to be returned officially.” They said: “The person to whom they were fallen wanted to get at least a reward for them.” “But this was impossible by law. These were not a find, but stolen values. A year later, a large collector and oilman addressed me. According to him, in 2003, he bought “Bum Erdeni” from Vasilchik. It was at the office, many people, including prominent public officials saw it. And how then could it be if it was allegedly stolen in 2008? The fake turned out to be stolen. A certain art dealer at the request of Vasilchik made an exact copy of this picture on canvas by the method of print for 100 thousand rubles. We found canvas cuts seized from the scene of the crime and compared to the original. The original work was never removed from the stretcher. It was never restored. The documents of the sale of the original were found. The picture was eventually removed from the database of “those wanted”. How did it end? A little time passed, and Vasilchik was found dead in the apartment. Everything from the apartment had disappeared. That is all. In the 1970s, the Ministry of Culture of the USSR asked Svetoslav Roerich to give the permission for his part of the collection to travel around the museums of the cities of the Soviet Union. At that time, it was successfully exhibited in Bulgaria. Svetoslav agreed. “At 7 am on October 27, 1978, a charter flight delivered 288 paintings of Nicholas and Svetoslav Roerich from Bulgaria to the USSR,” said the Vice-President of the International Center of the Roerichs, retired colonel Alexander Stetsenko. The paintings were touring around the cities of Soviet Union: Odessa, Lvov, Tallinn ... And then the collection was transferred to the State Museum of the Oriental Art, where it was buried in the storerooms and began ... to be melting. The number of works decreased by 6 paintings. Moreover, there they went through magical metamorphoses. The names, the years of writing and the sizes were changing. 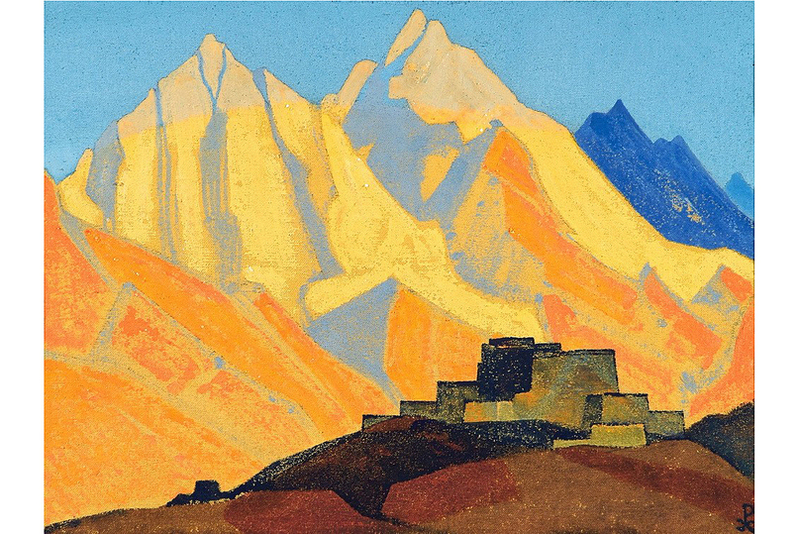 So, the picture, called by Nicholas Roerich as “Tibet,” turned into “The Monastery of Brahmaputra,” and after the same picture became known as the “Himalayas.” At first, it was dated by 1937, then by 1939. I compiled a table to compare the list and description of the paintings made by Svetoslav Roerich, the owner of the collection, with the list appeared at the State Museum of Oriental Art. Here, look! Paintings “dried up,” i.e. decreased in size to 111 cm! Over their 20-year stay in the State Museum of Oriental Art, they changed not only in size, but also in texture, material, colors. Here is a couple of examples. This picture was painted on canvas, and it turned out to be on cardboard. That one was written in tempera, and it turned out to be in oil. Scary! So Svetoslav determined to give his part of the heritage only to the non-governmental museum. He said this when he was meeting Mikhail Gorbachev. Gorbachev agreed. In June 1989, Svetoslav published an article “Inaction is not an Option!” in the newspaper “Sovetskaya Kultura” (“Soviet Culture”). There was a concept of an autonomous museum, outside the jurisdiction of the Ministry of Culture and the State Museum of Oriental Art. The second term of Roerich was to locate the non-governmental Center-Museum in the Lopoukhins’ estate, which he selected out of a number of buildings proposed by the Moscow government. A resolution of the Council of Ministers of the USSR was issued to create the Soviet Foundation of the Roerichs and the Nicholas Roerich Center-Museum. On March 19, 1990, in Bangalore Svetoslav Roerich signed a document, which later would be recognized as his will. By this document, Svetoslav Roerich ordered the State Museum of Oriental Art to transfer 288 paintings belonging to him to the Soviet Foundation of the Roerichs. The Soviet Foundation of the Roerichs, of course, began to demand them. A letter to the Ministry of Culture, another, the third, the fifth ... there was no answer. And then, the Soviet Union broke up. The Soviet Foundation of the Roerichs was transformed into the International Center, and the Ministry of Culture grabbed a chance not to recognize the ICR as the successor of the Soviet Foundation of the Roerichs. But Svetoslav was and remained the owner. He himself appealed to all instances. Svetoslav Roerich wrote in his letter to the Mayor of Moscow Yuri Luzhkov (April 26, 1992), “In 1990, I handed over the legacy of my parents to the International Center of the Roerichs (the former Soviet Foundation of the Roerichs). I would ask you personally to assist to transfer the Lopoukhins’ estate to a balance sheet or to a long-term lease to the International Center.“ Here are the excerpts from the address of Svetoslav Roerich to the Roerich societies of Russia and those of other independent States: “The International Center of the Roerichs was established on my initiative. … The Center has become the organization through which I can address Roerich societies and cooperate with them… Lyudmila Shaposhnikova is punctually applying my guidelines on how to use and keep my parents’ archives. Any other proposals to me as an heir and a donator with regard to it are unacceptable.” After this letter, there could be no doubt about the will of Svetoslav Roerich. There was also a document certified by an Indian notary, based on which Svetoslav Roerich as the sole owner of the heritage handed over to Russia finally recognized the rights of the ICR to the collection. There was a letter to Boris Yeltsin, kept in the archives of the President of the Russian Federation, where Roerich asked to transfer the collection from the State Museum of the Oriental Art to the non-governmental museum officially. On this occasion, a draft resolution was being prepared, but ... Svetoslav died. Ultimately, the collection was not transferred. “I think that there was really nothing to transfer, it was plundered,” Alexander Stetsenko said. “But at least we were not prevented from working at that time. It was extensive cultural program: traveling exhibitions, international conferences, in short, the ICR has been engaged in extensive and intensive cultural activities for more than 25 years. It was led by Lyudmila Shaposhnikova, who was awarded the “Order of Friendship” and the “Order of Merit for the Fatherland” of the IV rank by decrees of the President of the Russian Federation “for Roerichs’ heritage preserving and museum science developing.” The well-known diplomat Yuly Vorontsov was the president of the ICR, and Yevgeny Primakov was its trustee. So that no one bothered the ICR and the museum. Its leaders found a common language with the Ministry of Culture. Did Aristarkhov read the wills and official letters of Svetoslav Roerich?! If he did, how could he interpret the heir’s will in this way? Aristarkhov sent a telegram to the Ministry of Internal Affairs, where he reported that illegal immigrants from Ukraine illegally live and work in the ICR. Then a lot of appeals from some citizens came with complaints about the ICR. “The estate next to the Kremlin is a tidbit,” says Ivan Zasursky, a member of the Council under the President of the Russian Federation for the Development of Civil Society and Human Rights. “And many people heard about the criminal bureaucratic business: “to squeeze” historic mansions in good condition. The building was seized in the same way as black raiders or criminals would do: without court decisions that came into force, with power support of a certain private security organization without identification marks ... I still do not believe that all this happened. Well, in parallel it was important to seize the collection. They came up with an insidious scheme: they convinced the investigation of the Master Bank criminal case that all the activities of the ICR were carried out on the criminal money of the Head of the bank Boris Bulochnik. Boris Bulochnik was really one of the patrons of the center for ... 20 years. And it did not cause any questions either from Primakov or from the other trustees of the Center, because he did not have any problems with the law. When the ICR and Boris Bulochnik reported the Interior Ministry about the forthcoming export of legacy remains by Vasilchik, no one reacted in any way. But the report of the Ministry of Culture that the ICR is allegedly going to take out the legacy was reacted instantly. The investigative brigade withdrew all and transferred it to the State Museum of the Oriental Art ... without acts and other formalities. In such a way “the interests of the State” were defended! In the 90-s, people from the Ministry of Culture of the USSR and the KGB came to India to the son of Nicholas Roerich. They persuaded him to transfer the collection. What was not possible in the years of the totalitarian USSR, appeared to be possible today, in the era of democratic Russia. In theory, it is the State that should be the main defender of the paintings of the great artist. But it could not save the Roerich heritage. And those people who acts on behalf of the State, alas, remind me Iraida Bogdanova and Vasilchik. Could the world-famous cultural enlightener allow such people to manage his paintings? Whether his hopes to make his heritage publicly available as a part of Russia’s national wealth were in vain?